While going upvalley for a legendary tasting experience is a must, a day in Napa tasting rooms is an experience not to be missed. Without the upvalley rules, the tasting rooms in the city take on a whole new personality. And with nearly 40 tasting rooms in downtown Napa alone, there is endless opportunity to satisfy even the most ambitious wine enthusiast. Whether you want to taste an established estate wine, learn about a great family story, or discover a variety of small batch wines, Napa has you covered. And while you can’t go wrong with Napa Valley wine, you want to make sure the atmosphere and backstory are what you are looking to experience. Fortunately for everyone, Napa has a diverse community with a variety of influence. So there is a little something for everyone to enjoy….just like California herself! Overall, the tasting rooms in the city are a unique destination not to be overlooked. Here are just a few of our favorites…..
Do you love a great multi-generational family winery? We certainly do, and we especially love the cast of characters a family wine business creates! And since 95% of Napa wineries are family owned, the city is full of these great families that make this community unique. Around Napa you will find tasting rooms with these great family backstories along with a family member that is ready to share their passion of the family business. It’s both the wine and their stories that make these tasting rooms distinct. Vinoce is one of the newest Napa tasting rooms to (re) open. Founded by Lori and Brian Nuss in 1993, Vinoce Vineyards sits high above the valley floor on Mt. Veeder. With over three decades of wine making, they are devoted to creating wines with balance, power and uniqueness. Vinoce recently opened their new location on the Napa River at the historic Tannery building. This winery is completely family-run and on any given day you will find a Nuss family members ready to share their passion of wine and family story in a relaxed atmosphere. Brown Estate is another legendary family run Napa Valley winery. Brown Estate Vineyards is the first and only Black-owned estate winery in California’s Napa Valley. They are best known as the region’s most well-regarded zinfandel producers. And they have brought their tasting experience to downtown Napa at Brown Downtown. This tasting room oozes urban chic and makes you feel a just little cooler simply walking through the door. The welcoming service, cool urban vibe, awesome family backstory, and world class wine makes this tasting room a must do in downtown Napa. While there are plenty of tasting rooms concentrated around downtown Napa, there are also plenty off the beaten path. These tastings rooms are true treasures and Napa is full of these hidden gems. This makes Napa a great place to go out and explore. Want to taste an amazing Howell Mountain wine without having to do the drive? Robert Craig tasting salon is a perfect place for you. This tasting room sits in an nondescript office building near the River Terrace Inn. Here you can taste amazing Napa Valley Cabernets in a relaxed and welcoming atmosphere. In addition, you will find wine experts who want to teach you about not just wine but also Napa Valley. Don’t worry, they’ve never heard a stupid question and welcome all types of wine enthusiasts. This is the perfect place to taste great wine, learn about the valley, and have a laid-back California tasting experience. If you really want a unique experience, then head south of town to the industrial “crusher wine district”. This new district is a collaboration of nearly a dozen young wineries and tasting rooms within two industrial parks. One of our favorite is Buccalla who produce handmade, luxury wines. This winery is run by an amazing couple that made their dreams come true. The great wine, backstory, and location, make this tasting room unique and something you’ll tell your friends about. As Napa has become the hub for Napa Valley adventures, larger established Napa Valley wineries want to get in on the action. In addition to the small batch boutique wineries who’ve enjoyed the city for a while, the legendary estates see value in going downtown. With this new wave of upvalley estate wineries coming to Napa, it further solidifies downtown as a destination itself. Another new occupant coming to First Street Napa is Mayacamas Vinyards. Founded in 1889, Mayacamas has played a role in both the history and modern era of Napa Valley. And now, their chic new multi-use venue will include a wine boutique, sidewalk patio and private tasting space right in the heart of downtown. Variety is the spice of life. And with over 500 wineries in Napa Valley, variety is definitely a part of Napa life. The majority of Napa Valley wineries produce less than 10,000 cases a year, which means there is endless opportunity to discover new wines. Rather then speding years going to each winery, there are tasting rooms where you can indulge in a variety of wineries under one roof. If you like variety, then you’ll love Feast it Forward. Not only is it a TV studio for the Feast it Forward Network, but it is also a 16 winery tasting collective. But what really makes this location unique is the design element. The ground floor is an “experiential showroom” that is designed with the materials and products of more than 30 national sponsors….and it’s all for sale. Everything is catalogued and tagged on a high-tech, virtual showroom, displayed on a Microsoft platform screen. And although you can make a purchase anywhere you look, the shopping experience doesn’t feel forced. Visitors are encouraged to relax, sip some wine, and get inspired. The Vintner’s Collective is also a great place to discover small batch wineries. This downtown location is a collection of boutique Napa Valley vintners who share this tasting room space. But what may be more even more interesting about this space is the building itself. The Vintner’s Collective closed after the 19th century stone façade tumbled onto Main Street during Napa’s 2014 earthquake. While the core structure held firm, the damaged sandstone blocks on the exterior made entry into the tasting room impossible. The building is now back to new and a great place to discover amazing Napa Valley wines (and see photos of the earthquake damage). 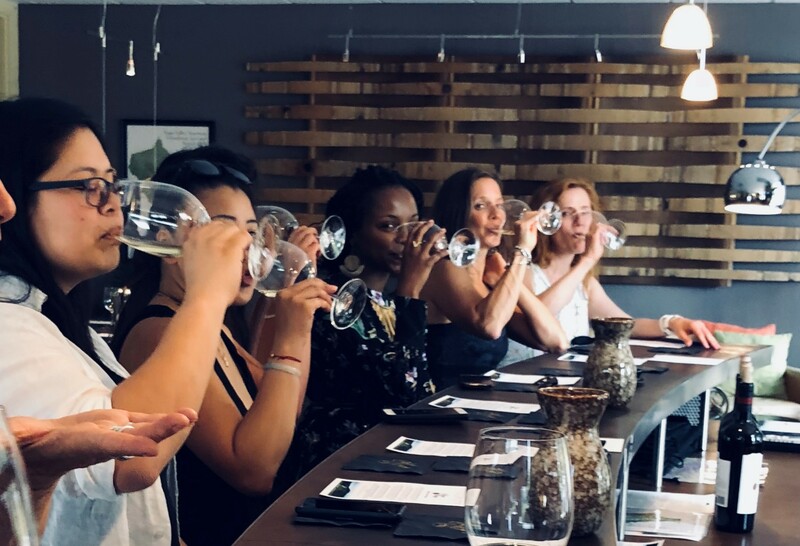 Whether you are new to wine tasting or a master sommelier (or anywhere in between), the Napa tasting rooms will certainly satisfy your palate. From small batch to established estate wines, there is endless opportunity to indulge in the best Napa Valley has to offer. In addition, Napa’s tasting rooms provide a unique urban wine experience that is distinct from the rest of the valley. So why not take a walk, hop on a bike, or book a Paper Napan Walkabouts and see what the city has to offer.